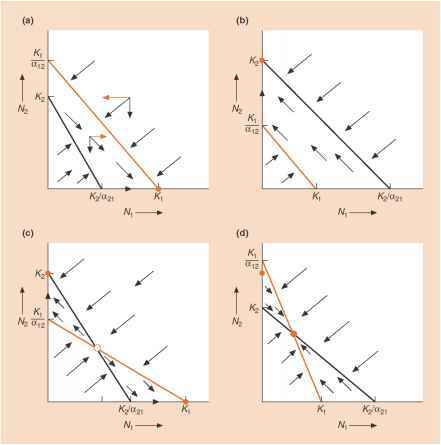 Type 3 functional responses are illustrated in Figure 10.10a-c. At high prey densities they are similar to a type 2 response, and the explanations for the two are the same. At low prey densities, however, the type 3 response has an accelerating phase where an increase in density leads to a more than linear increase in consumption rate. Overall, therefore, a type 3 response is 'S-shaped' or 'sigmoidal'. One important way in which a type switching 3 response can be generated is through switching by the predator (see Section 9.5.2). The similarities between Figures 9.15 and 10.10 are readily apparent. The difference is that discussions of switching focus on the density of a prey type relative to the densities of alternatives, whereas functional responses are based on only the absolute density of a single prey type. In practice, though, absolute and relative densities are likely to be closely correlated, and switching is therefore likely to lead frequently to a type 3 functional response. More generally, a type 3 functional response will arise whenever an variations in increase in food density leads to an searching efficiency increase in the consumer's searching or handling time efficiency, a, or a decrease in its handling time, Th, since between them these two determine consumption rate (Equation 10.19). Thus, the small mammals in Figure 10.10a appear to develop a search image for sawfly cocoons as they become more abundant (increasing efficiency). The bluebottle fly, Calliphora vomitoria (Figure 10.10b), spends an increasing proportion of its time searching for 'prey' as prey density increases (Figure 10.10d), also increasing efficiency. Whilst the wasp Aphelinus thomsoni (Figure 10.10c) exhibits a reduction in mean handling time as the density of its sycamore aphid prey increases (Figure 10.10e). In each case, a type 3 functional response is the result.